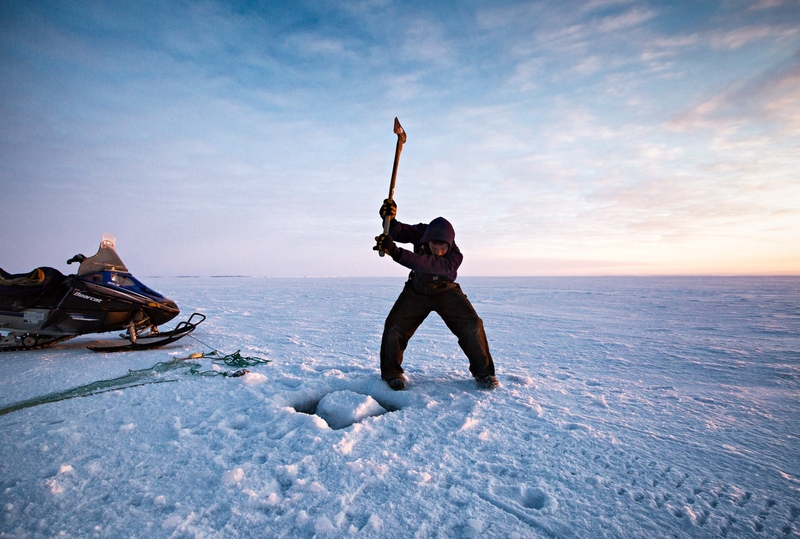 Andrew Ningealook, 26 years old and a life long resident of Shishmaref, breaks the ice before laying his fishing net under the ice. 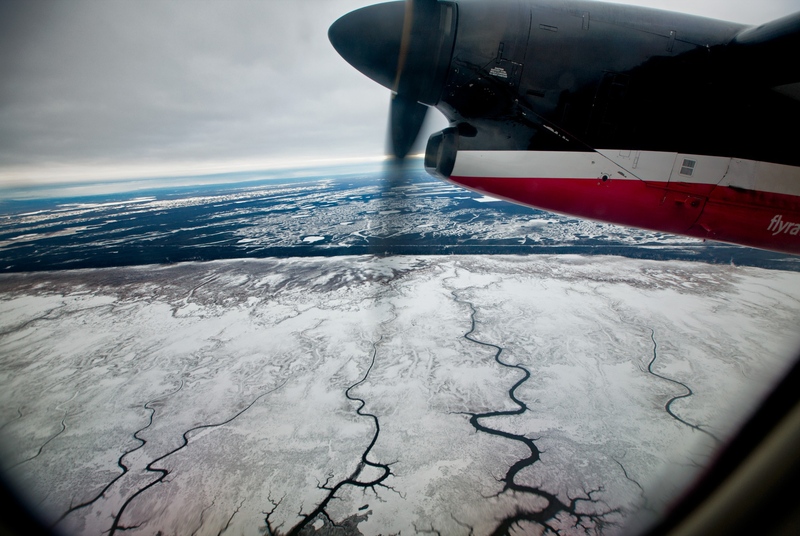 The view of the Alaskan tundra from the plane on the way to Shishmaref. 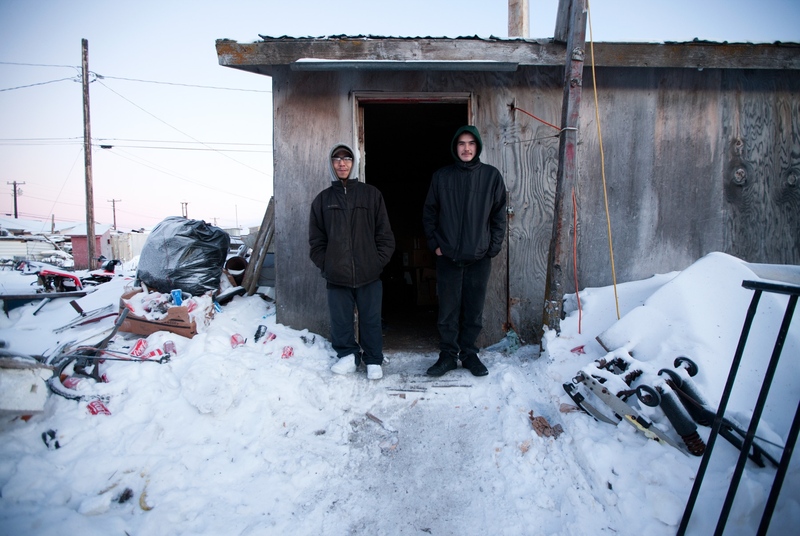 Shishmaref, Alaska is a small city of 600 Inupiaq Eskimos who have lived on the Sarichef Island in the Chukchi Sea, just north of the Bering Strait and about five miles away from the mainland Alaska. 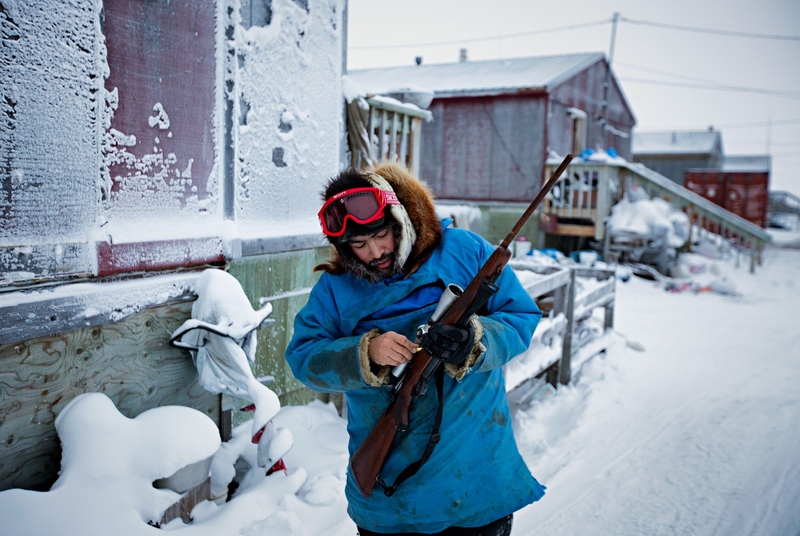 Fred Weyiouanna, 32 years old, and a life long resident loads his Ruger 77 rifle that he uses to hunt caribou. Caribou meat is a major source of food for residents of Shishmaref. 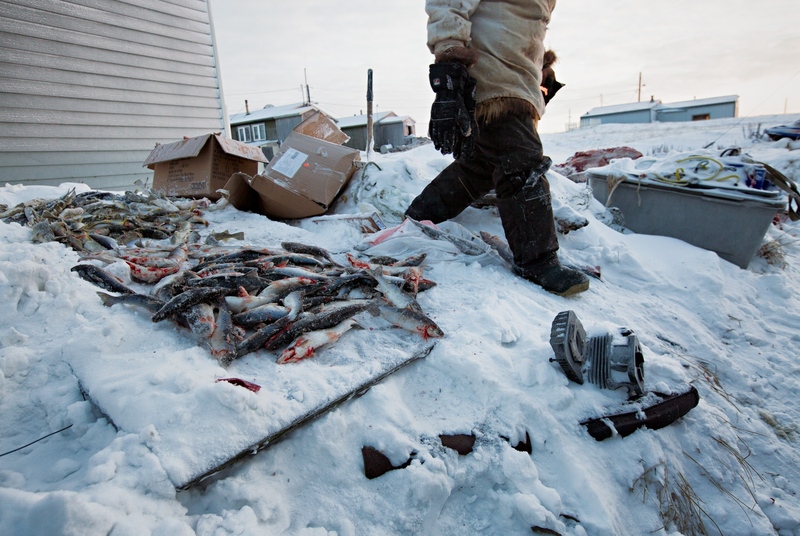 A resident of Shishmaref lays out his fresh catch of whitefish in front of his home to freeze. Most hunters simply leave their catch outside in the freezing weather which serves as a perfect freezer. A freshly caught seals waits to be cut and processed. Seal is one of the primary sources of meat for the people of Shishmaref, Alaska and their dogs. Leaving the fresh kill outside provides perfect and convenient freezer storage. 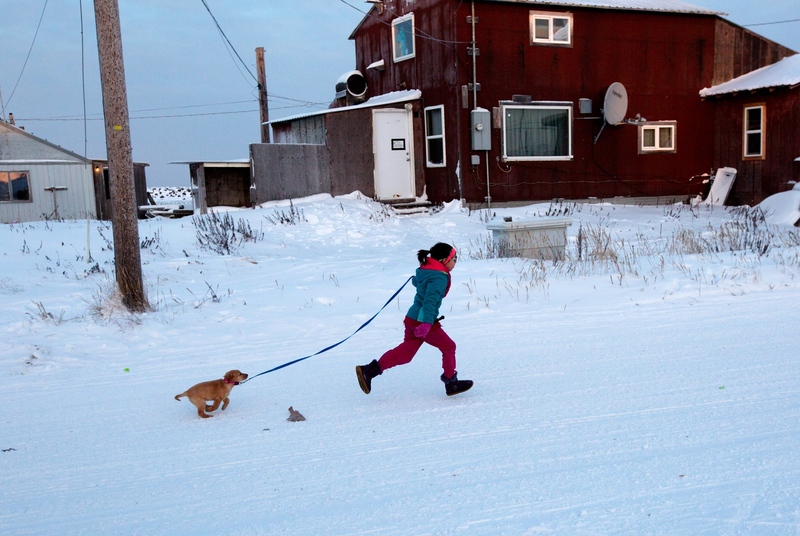 A young Shishmaref resident runs with her puppy on the main street in the village. Puppies older than 4 weeks old must be on the leash although the rule is generally not observed. Andrew Ningealook (38) is married to Faye and is father of four rambunctious boys: Lars (7 months), Pancho (2), Ryan (4), and Andrew (6). He is a graphic design artist who spends his time carving ivory tusks and working in graphic design. 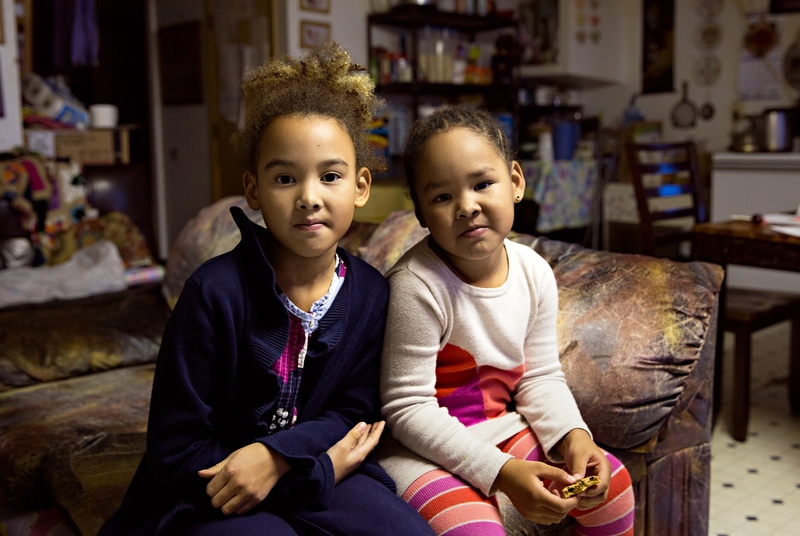 Kiyeivi (7) and Kalaya (3) stay with their grandmother during after school hours while their mother is at work. 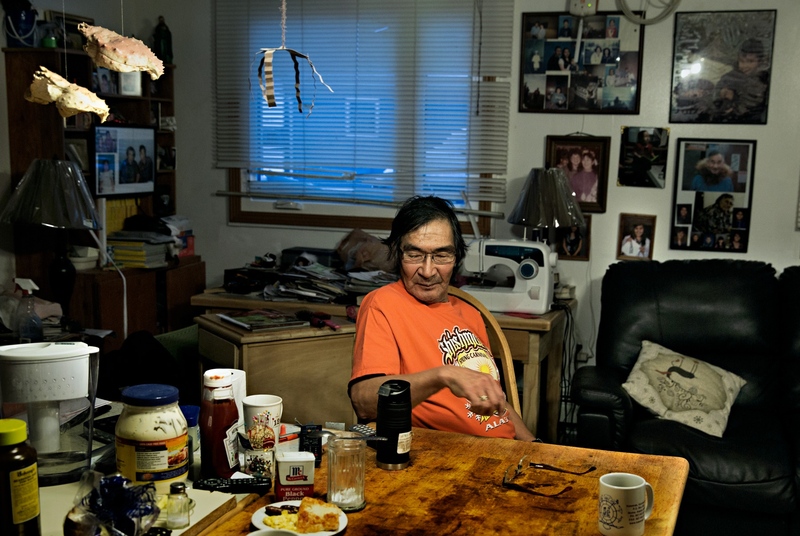 Johson Eningowuk - 68 years old - is a life long resident of Shishmaref. He and his wife they have a regular seat at the community center Bingo game. Bingo is the only pastime in which many residents regularly participate every night except Wednesdays and Sundays to allow for people to attend church services. 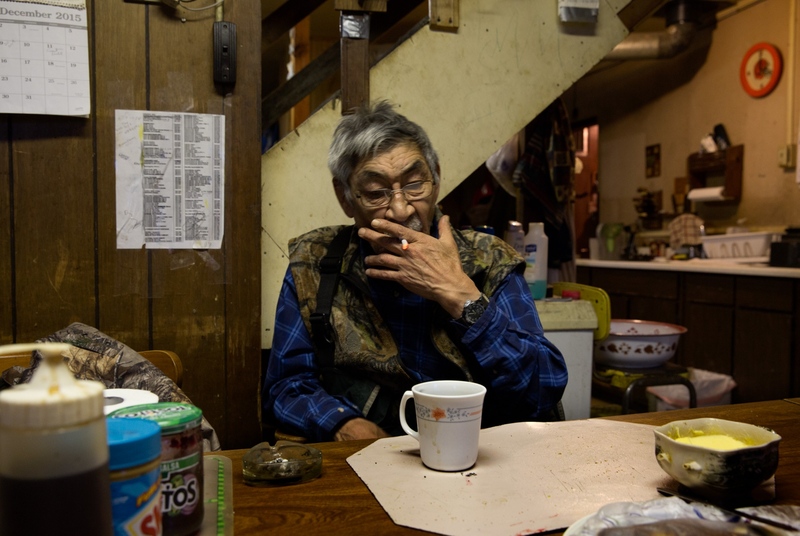 Ardith Weyiouanna, 68 years old has been a lifelong resident of Shishmaref, Alaska. She looks after her grandchildren during the days when her children are out working or hunting. Speed boats of various sizes are stored on the beach. In the spring they are used to hunt caribou and seals. 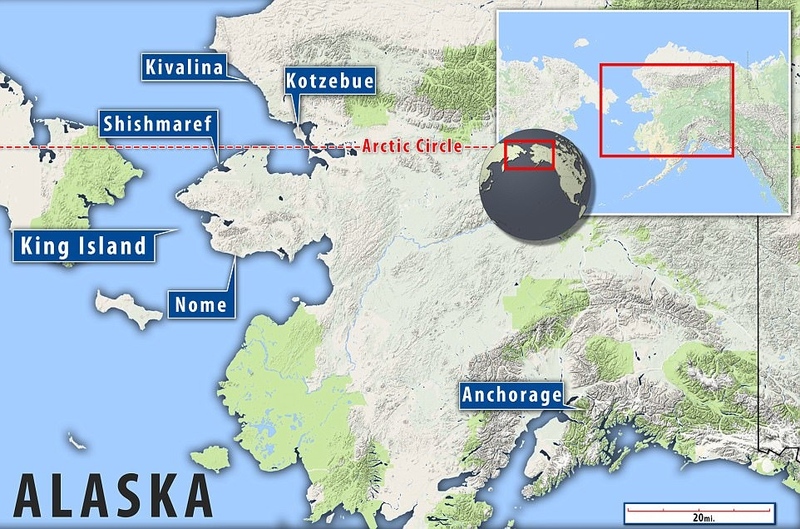 Shishmaref, Alaska is a barrier island in the process of disappearing due to melting permafrost upon which it is located and the rising of the sea levels due to climate change. 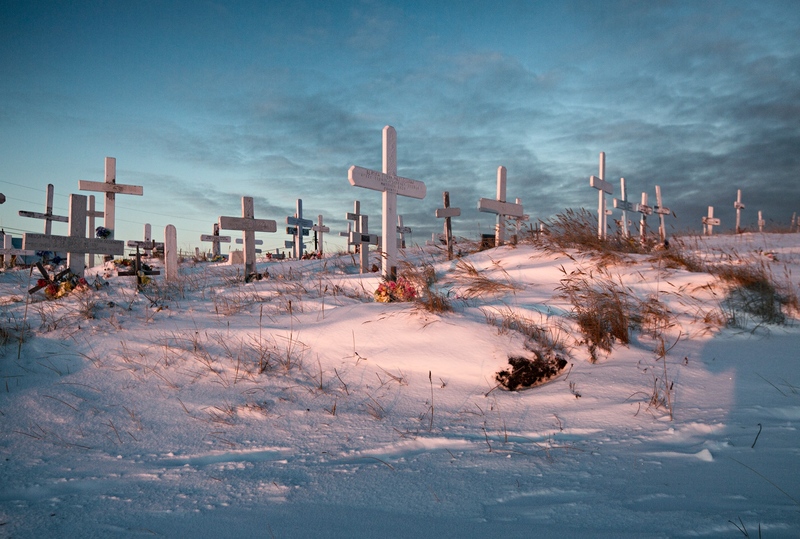 The cemetery in Shishmaref is centrally located and is in front of the Lutheran Church-the only church on the island. 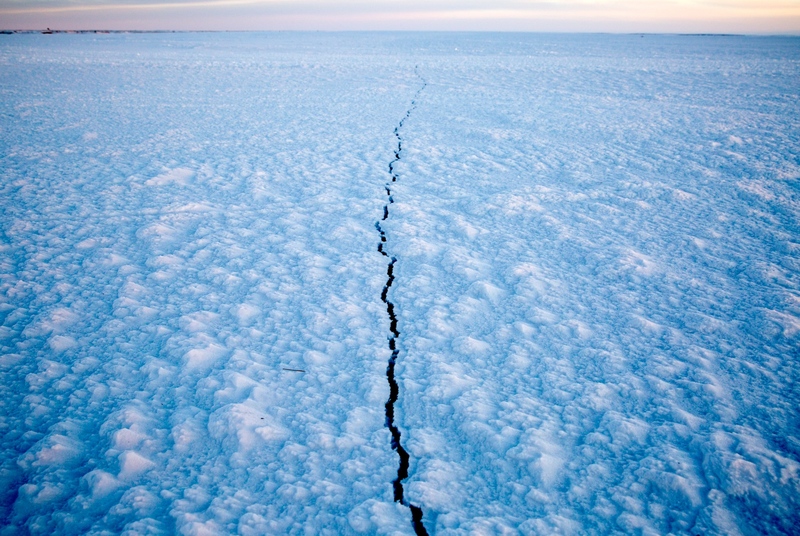 A crack in the ice formed on the Shishmaref Inlet which once frozen provides the residents of Shishmaref with an easy access to the mainland and allows them to go further to hunt for caribou, bears and wolves. 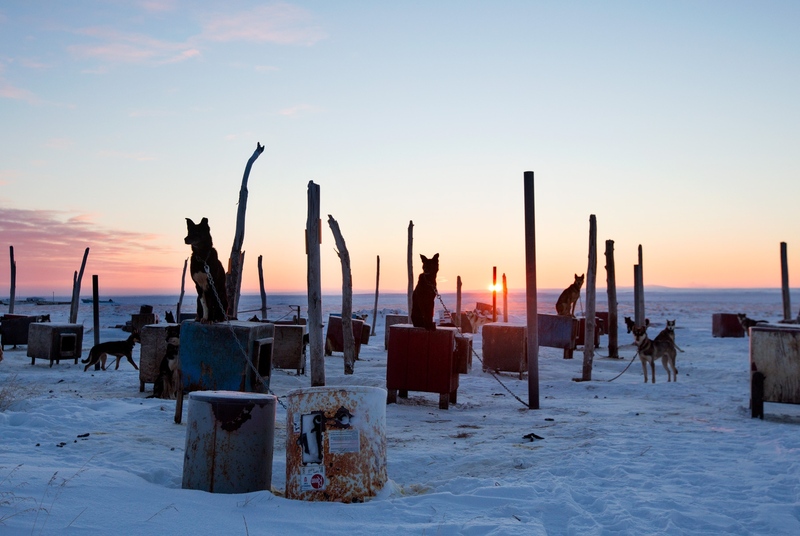 Sled dogs wait to be fed. Each individual dog has its own shelter and are fed individually. 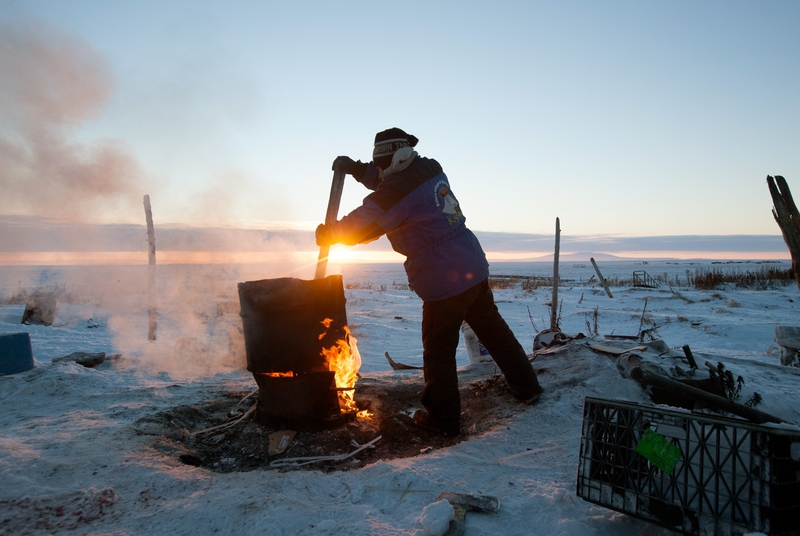 A resident of Shishmaref cooks seal meat and blubber to feed to his kennel of sled dogs. He has couple of dozen dogs being trained sled running. Fred Weyiouanna - 32 years old with his two sons Isaak (4 years old) and Tyson (2 years old). 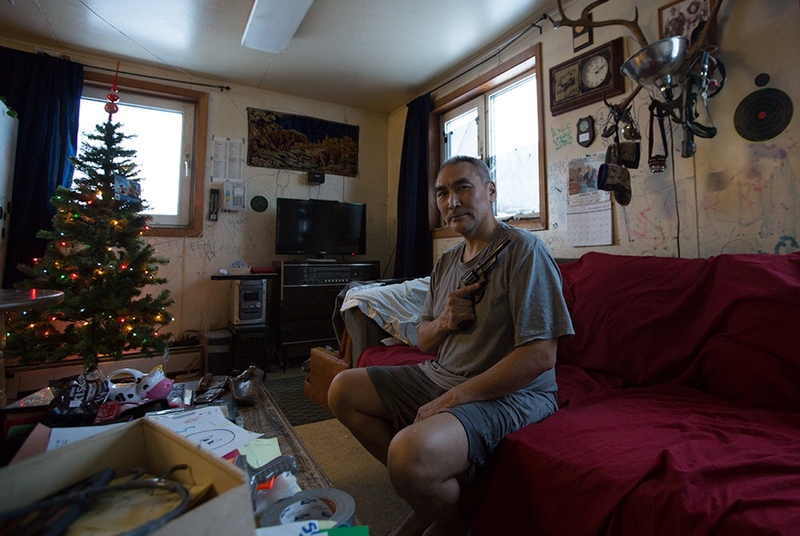 Fred is a life long resident of Shishmaref, Alaska. He hunts to supply meat for his family as well as two other family members' households. Johnny Weyiouanna Sr., is 80 years old and has been a resident of Shishmaref all his life. He lives with his wife Ardith (68) and takes care of his grandchildren during the day. Bingo is one of the few recreational pastimes available to the residents of Shishmaref, and is held every night except on Sundays and Wednesdays so as to allow the residents attend the Church services. Once a player calls "Bingo" a game official reads out loud the numbers and the bingo caller confirms the win. Payment is then received on the spot. While in this case the pot was about $350, prizes as high as $1000 are awarded each night. 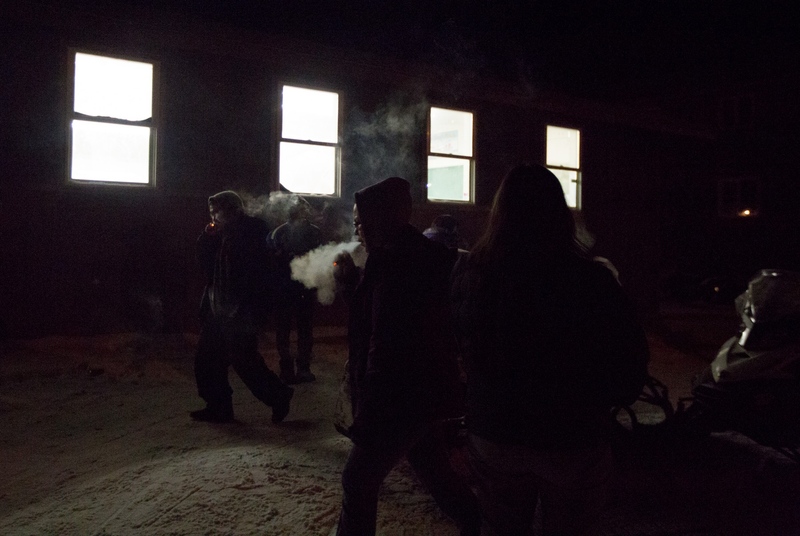 During a break from bingo, players go outside to smoke and regroup. Shishmaref is a dry town and imposes hefty fines on possession and/or consumption of alcoholic beverages. 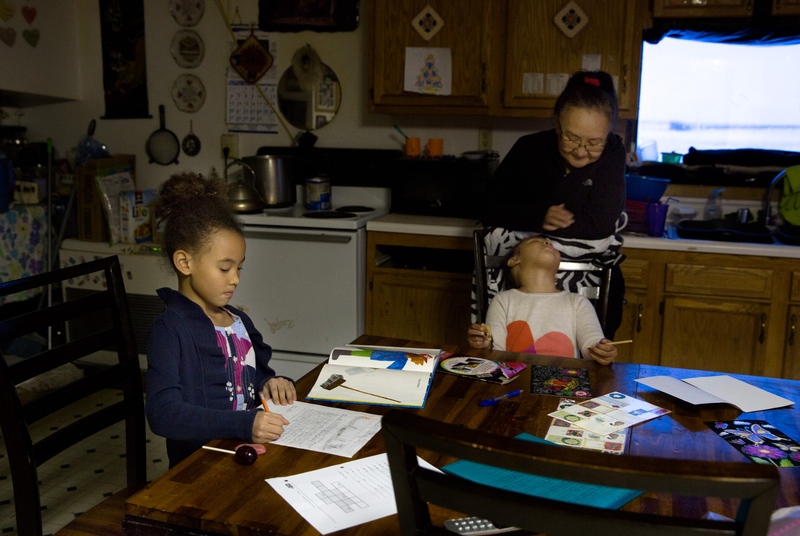 Bingo and various forms of lottery are the only recreational pastimes available to the residents. Nora Iyatunguk washes her son, Gilford, in the women's section of the Washeteria in Shishmaref, Alaska. A bucket of hot water for this purpose is $2.00. The Washeteria is the only place for residents to take showers and/or wash their clothes. Elders get their laundry done for free and get free use of the showers. 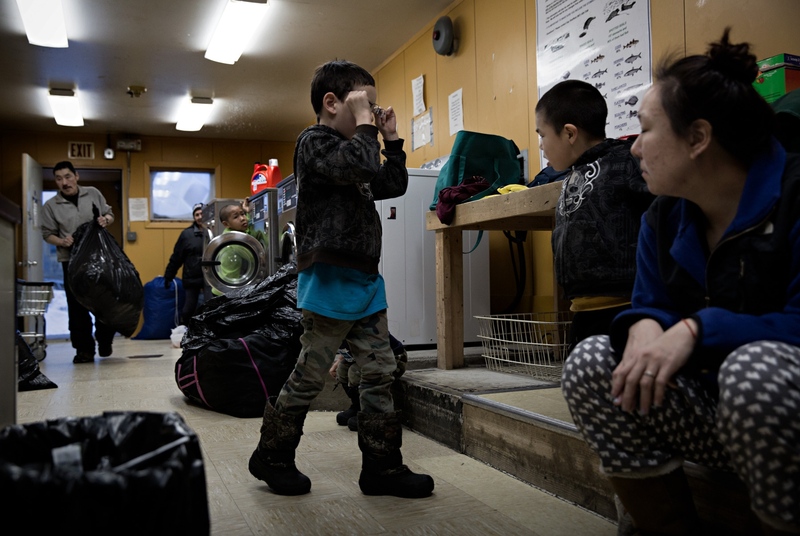 Residents of Shishmaref, Alaska wash their laundry and take showers at the Community run Washeteria. Practically none of the homes in the Village have running water and so for $3.50 a resident may take a 10 minute hot shower. The Elders of the village get free laundry (must provide their own detergent) and free shower. 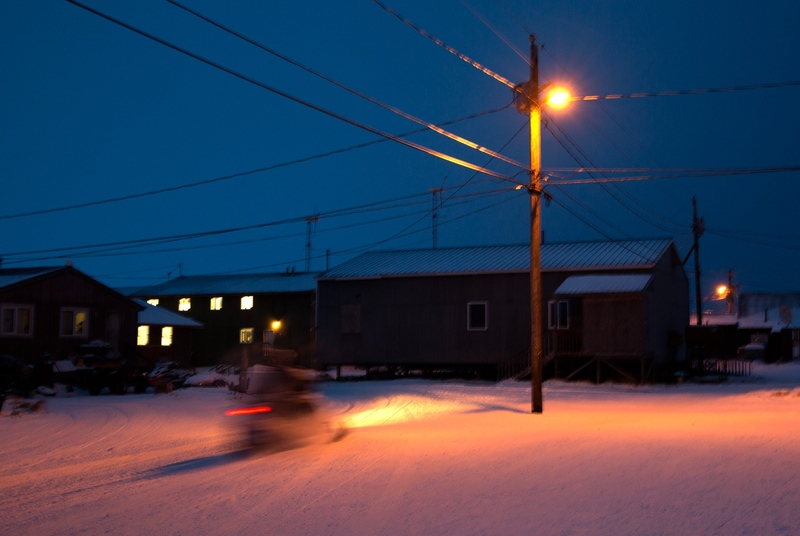 Although most residents of Shishmaref are officially members of the Lutheran Church (the only church in the village), they also observe and respect their traditional Eskimo practices and beliefs. During the Sunday service, Pastor Marvin Jonasen sings to the children as part of his sermon. 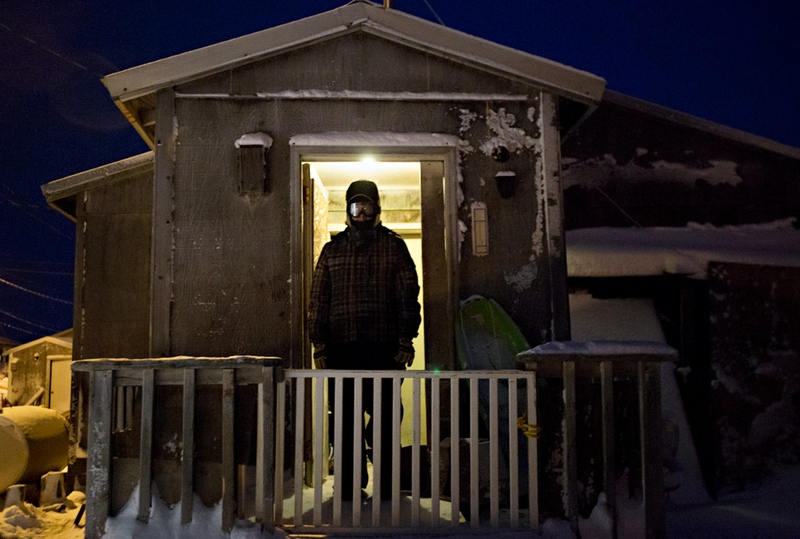 Justin Eningowuk, 27 years old, waits for his snow machine to warm up on a frigid morning before heading out to work. Shishmaref's center "square". Snowmobiles or “snow-go” are a primary source of transportation in town and for hunting food. 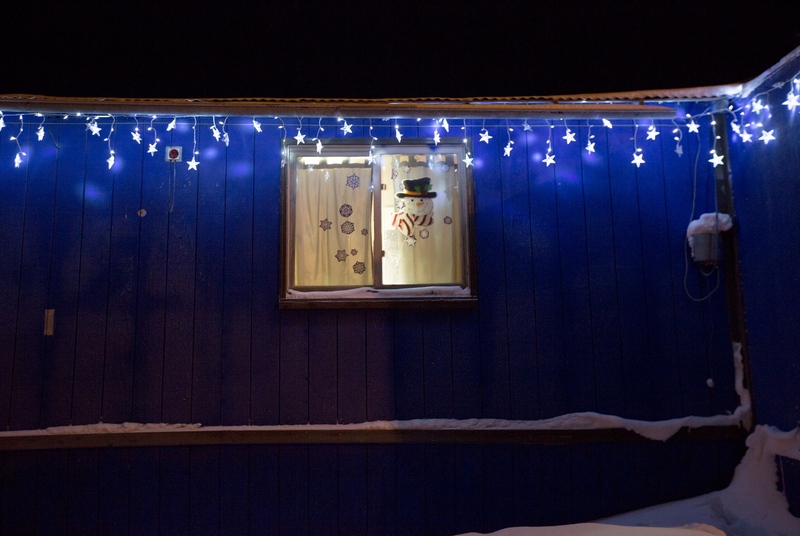 Many homes in Shishmaref are decorated with Christmas lights and decorations during the Christmas season. 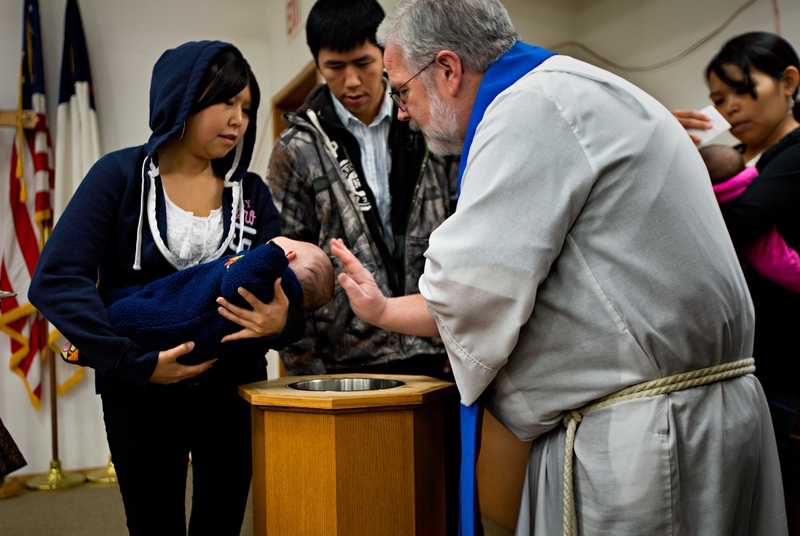 Although most residents are members of the Lutheran Church, they also observe their native Eskimo spiritual practices. 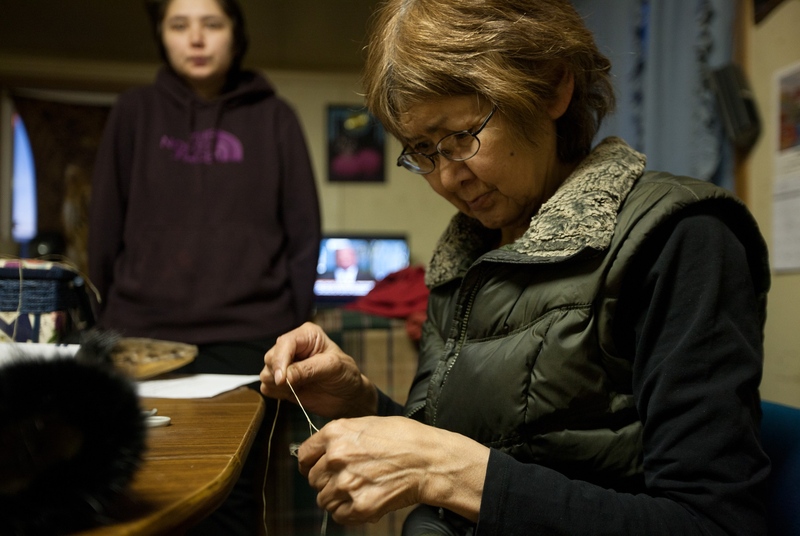 Allison Neyoktok, 26, watches her mother, Catherine Neyoktok, 62, sew mittens using seal fur and skin. 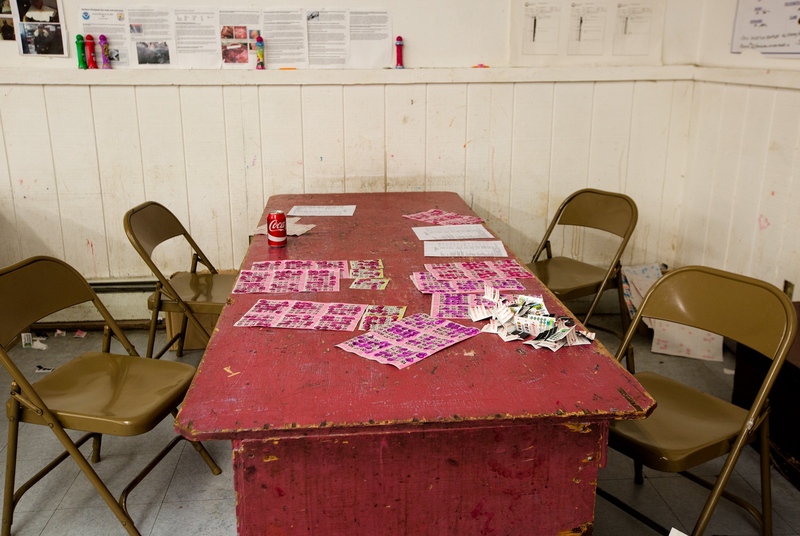 On weeknights they play bingo at the Shishmaref Community Center. Catherine is a fourth generation of Neyoktoks born in Shishmaref. 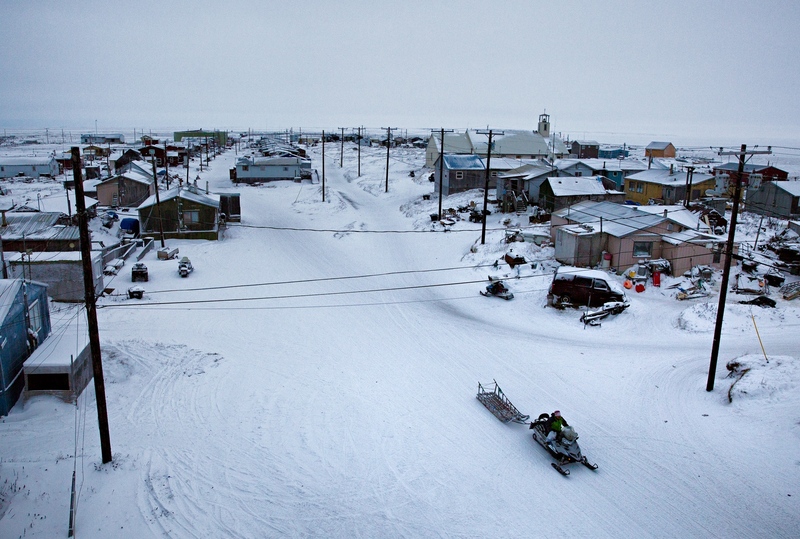 53 year old Percy C. Curtis was born in Kotzebue, Alaska before moving to Shishmaref to live with his grandparents. He does not own any rifles for hunting but has an old 357 Magnum revolver he reluctantly holds for me. He works seasonally on oil fields in Alaska. Lena Weyiouanna, 64, a longtime resident of the village, works as a janitor at the Shishmaref Clinic. 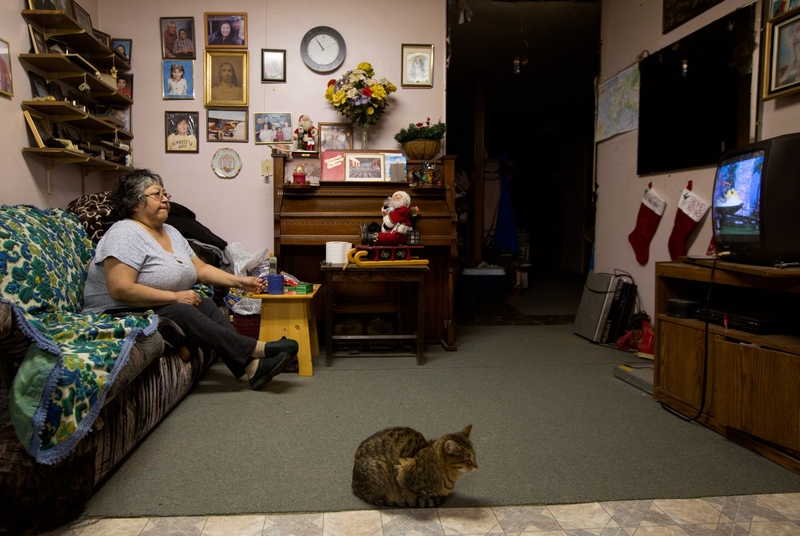 She lives alone with her cat in a small structure. 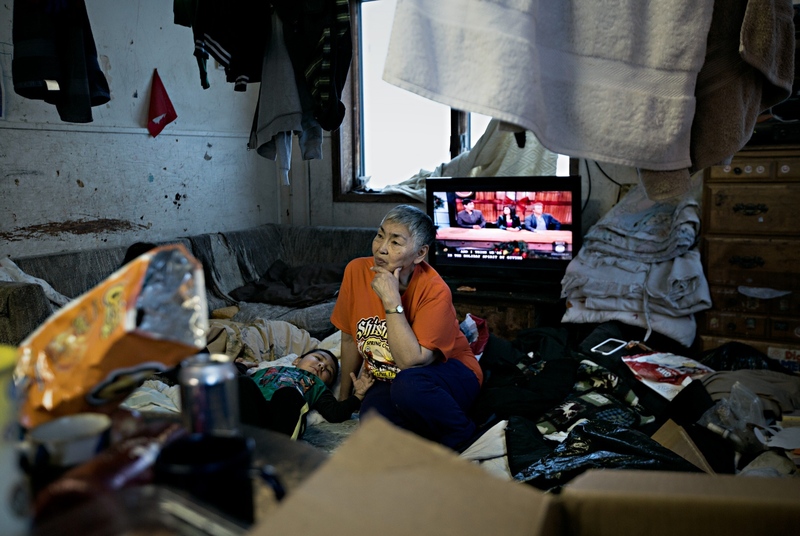 Dennis Sinnok was born in Anchorage, Alaska, and moved to Shishmaref when he was a child. He has lived in Shishmaref ever since. He is an accomplished bear, wolf, seal and walrus hunter. Dennis works for the only airline that serves Shishmaref. As a side job, he also assists residents to gather and sell their artwork, carvings, furs and various fur related products in the mainland. 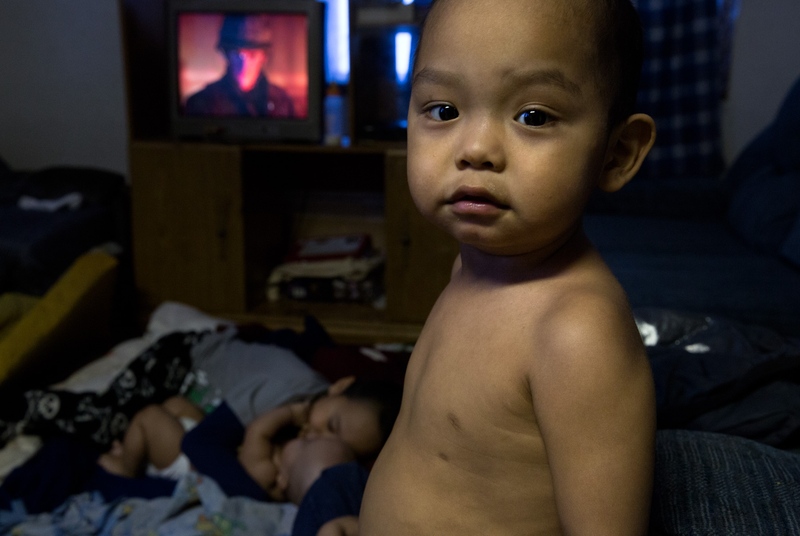 Ryan Ningealook, 4, looks on while his two brothers slept on the floor in the only room in their small home in Shishmaref, Alaska. 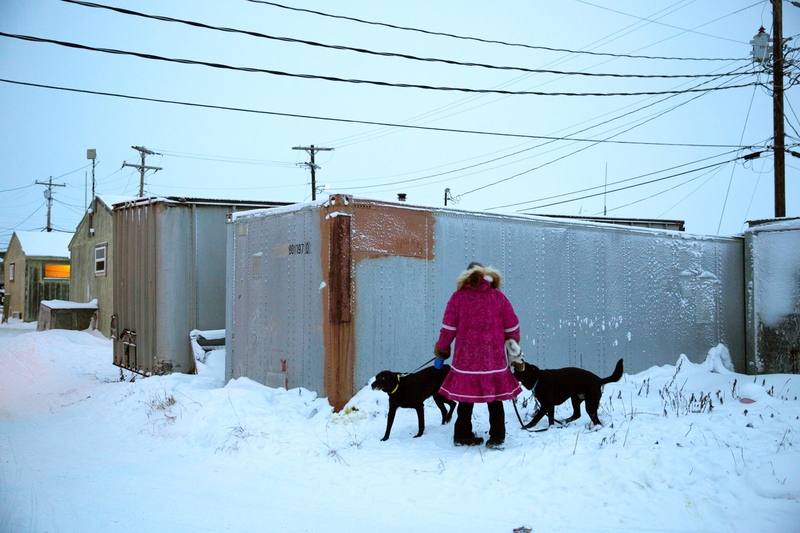 Mary Kiyutellukinguk was born in Nome, Alaska. She has lived all of her life in Shishmaref and takes care of her granddaughters Kiyeivi, 7, and Kalaya, 3, after school while their mother is at work at the school. Mayor of Shishmaref for the past three years, Howard Wayiouanna washes up before getting ready to attend a City Council Meeting. 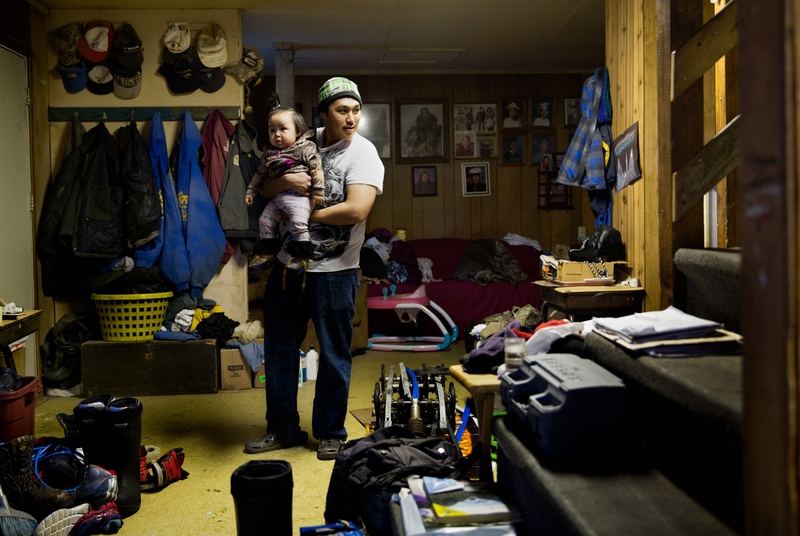 A resident of Shishmaref holds his daughter in their home that he shares with his father. 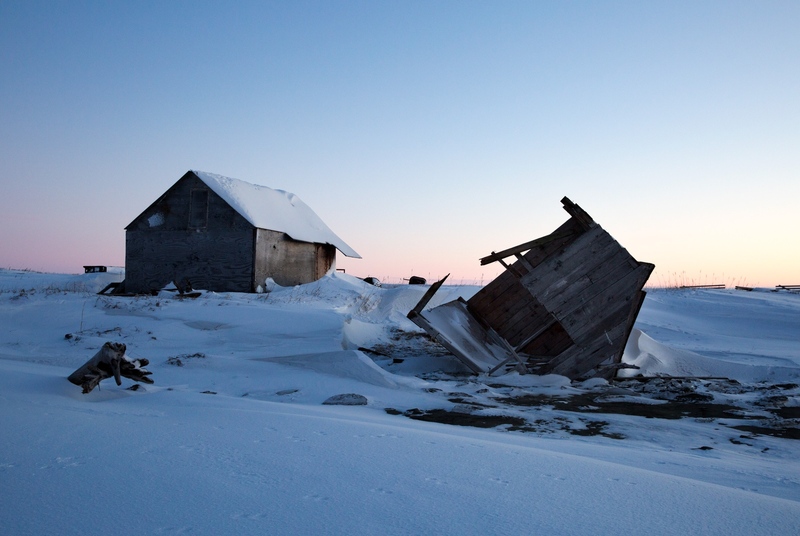 Residents on the island face an uncertain future — it faces inundation because of melting permafrost and the rising water levels resulting from climate change. 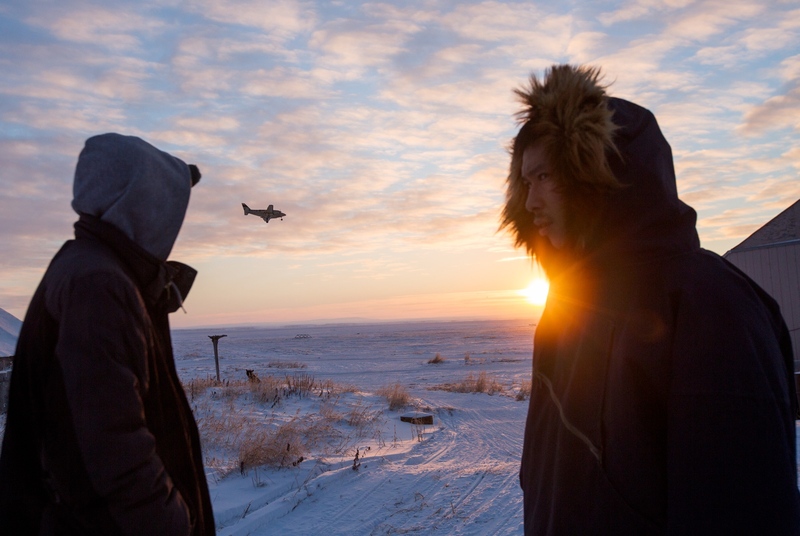 Andrew Ningealook, left, and his cousin Thomas Eningowuk speak together while a twin-engine plane makes its final approach before landing at the Shishmaref airport. During the previous storms and coastal erosion, various structures have toppled over. The warmer seas prevent the formation of ice that used to provide a natural barrier to erosion during the stormy seasons. Without this natural barrier, the Island of Shishmaref, Alaska is disappearing at a moderate and steady pace. 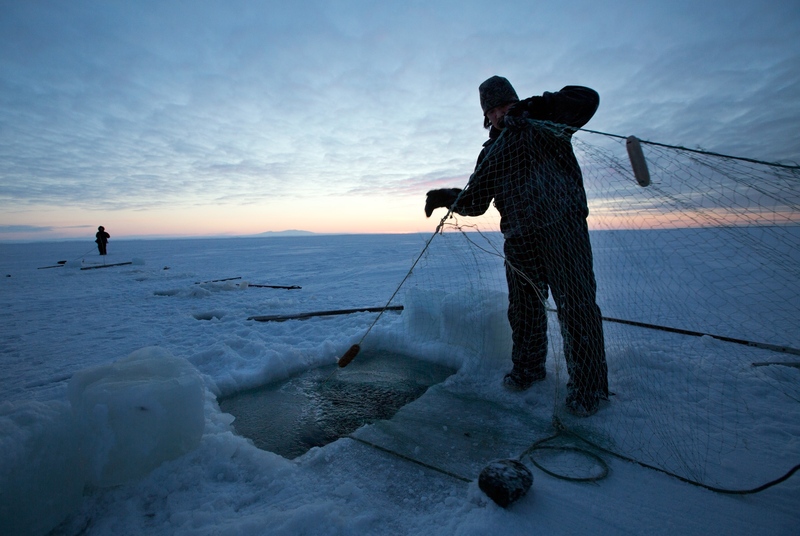 After breaking the ice, Andrew Ningealook, 26, and his cousin Thomas Eningowuk, 32, lay their fishing net under the ice. They will leave the net for several days before returning to check if they have caught anything. Fishing has become less abandonment because with the seals have access to the lagoon from the sea now that the sea takes longer to freeze. 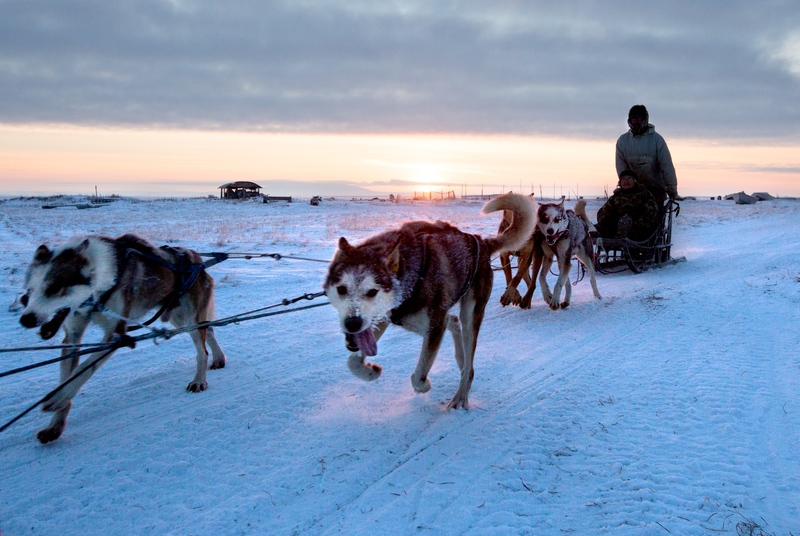 A resident of Shishmaref returns home from a dog run where the dogs are trained both the discipline and endurance necessary for mushing. Carmen Russo, resident of Shishmaref for only four months, teaches 6th grade at the Shishmaref School. 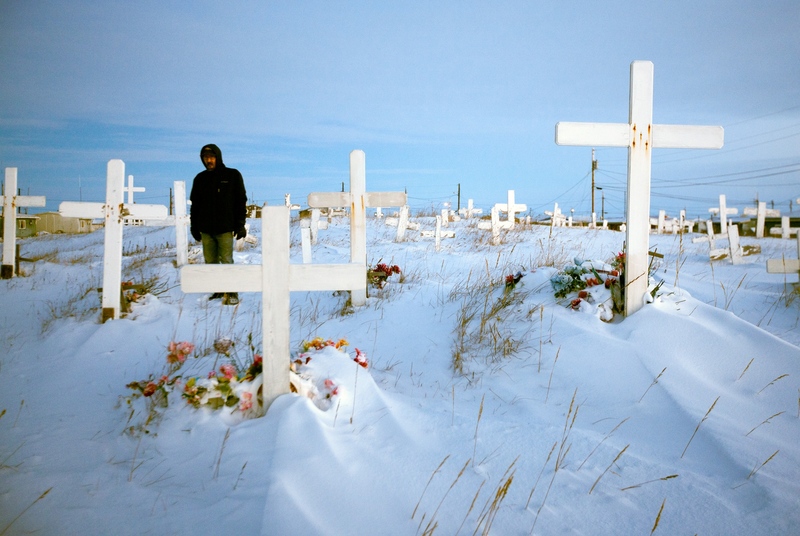 A resident of Shishmaref visits his sister's grave on the 17th anniversary of her death. The cemetery is centrally located in front of the Lutheran Church - The only church in the village. Marie, one year old, is one of the toddlers in Shishmaref, Alaska. 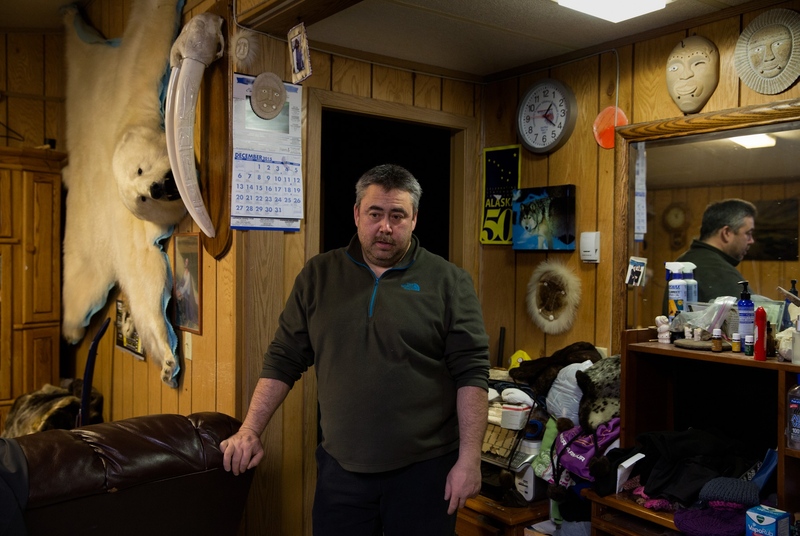 Residents in Shishmaref, Alaska face an uncertain future. The island is sinking due to melting of the permafrost upon which it is located and the rising water levels due to climate change. Predictably, the Island will disappear within the next ten to twenty years. As of now, there are no solid plans for relocation of the village and its residents. 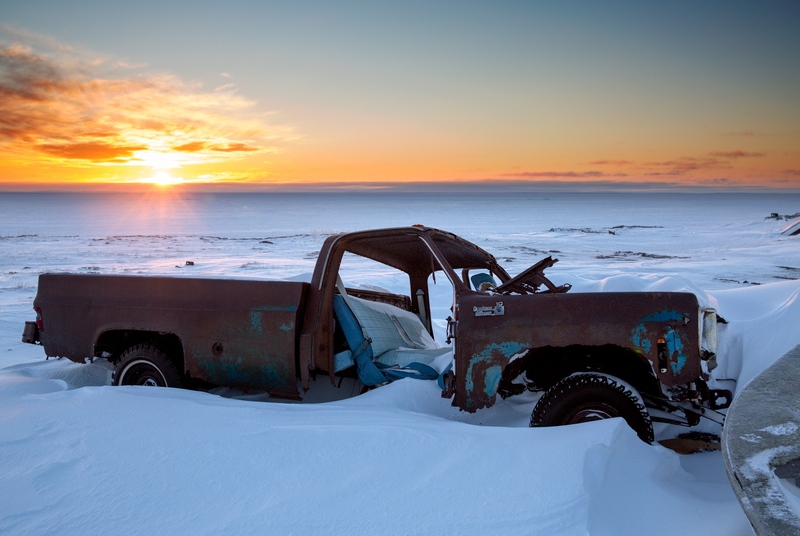 An abandoned truck in junked on the beach in Shishmaref, Alaska. 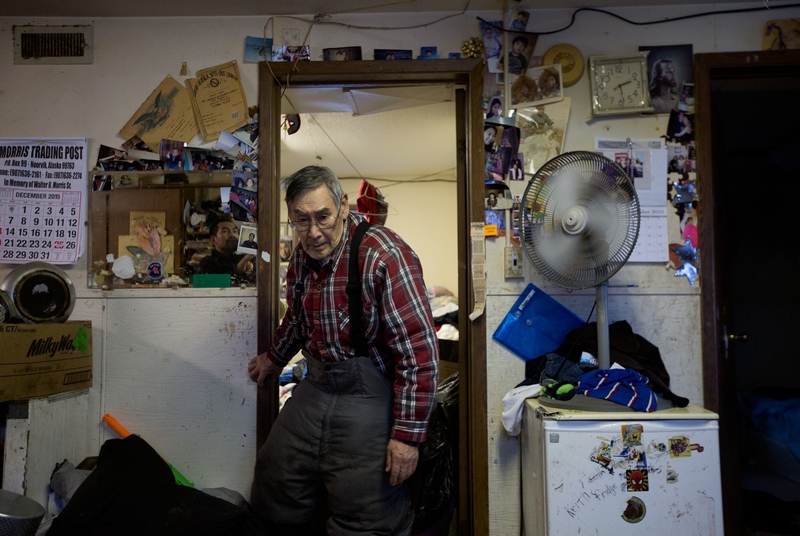 A very generous and authentic resident of Shishmaref, Alaska, is 74 year old Clifford Wayiouanna. He is proud of his 13 grandchildren and 4 great-grandchildren. During our visit, he recounted the story of how he taught himself how to fly his airplanes - over some of his excellent homemade caribou stew. When he was younger, he was an officer in the National Guard for 7 years, 11 months, 10 days and 2 hours. 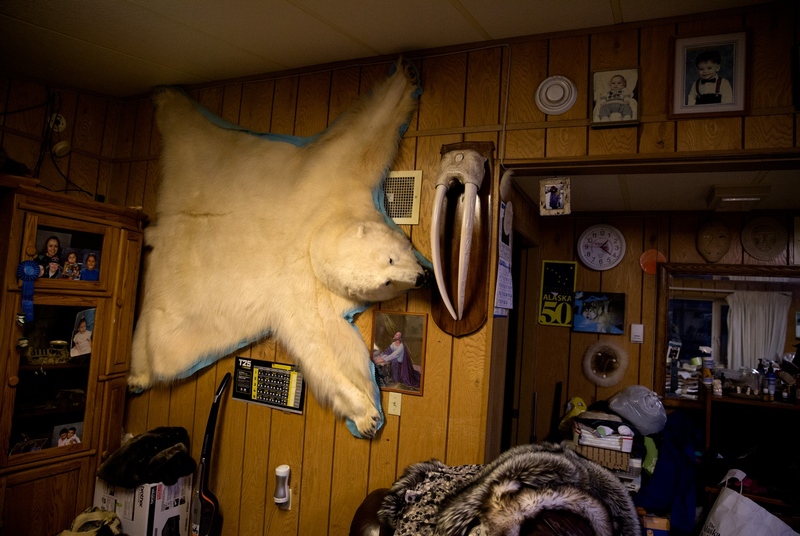 Bear skin, walrus tusks and other animal byproduct help bring income to the residents of Shishmaref, Alaska. 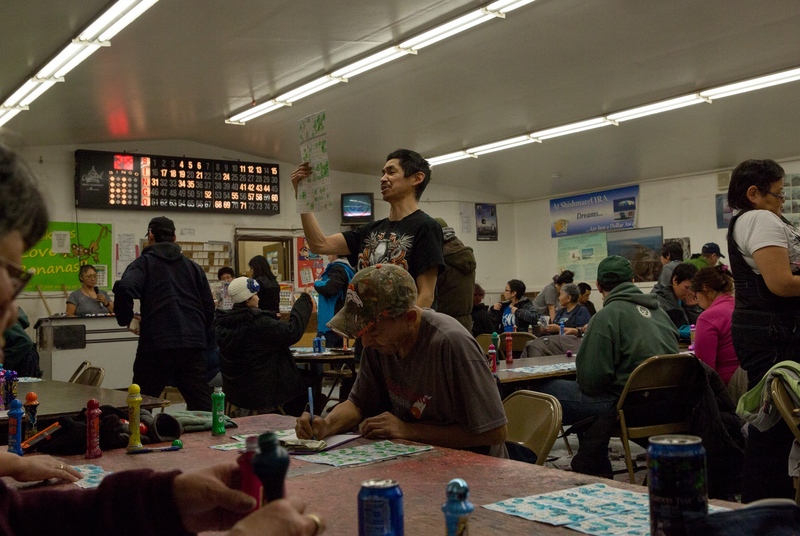 Bingo is a regular pastime of the residents of Shishmaref, Alaska and is held every night except on Sundays and Wednesdays so as to allow the residents attend the Church services. Once a player calls "Bingo" a game official reads out loud the numbers and the bingo caller confirms the win. Payment is then received on the spot. While in this case the pot was about $350, prizes as high as $1000 are awarded each night. 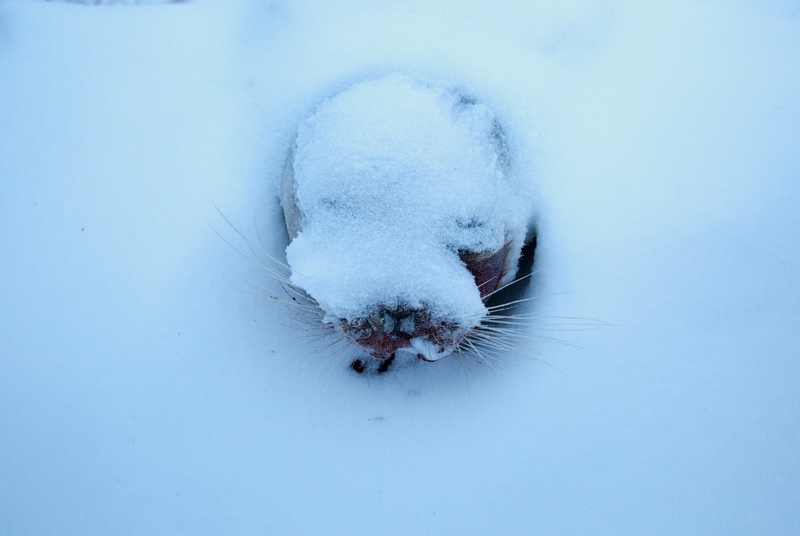 A frozen seal left outside of a resident's home. 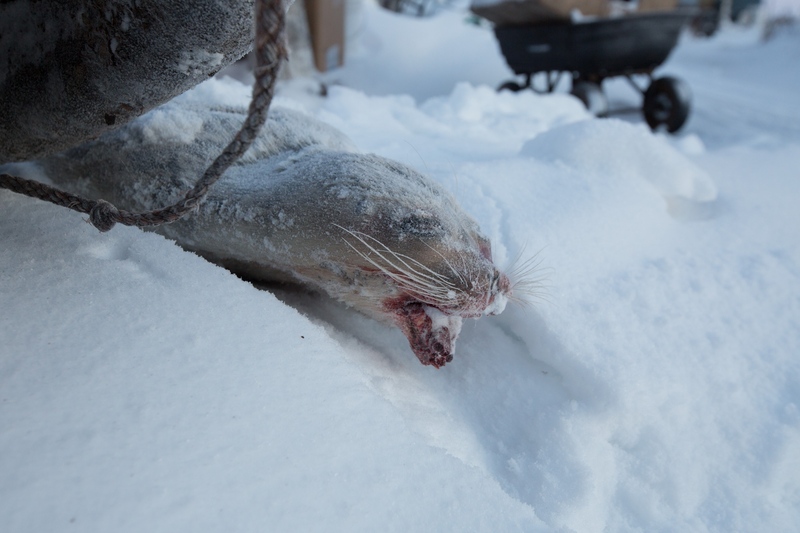 Seal is one of the primary sources of meat for the people of Shishmaref, Alaska and their dogs. Leaving the fresh kill outside provides perfect and convenient freezer storage. 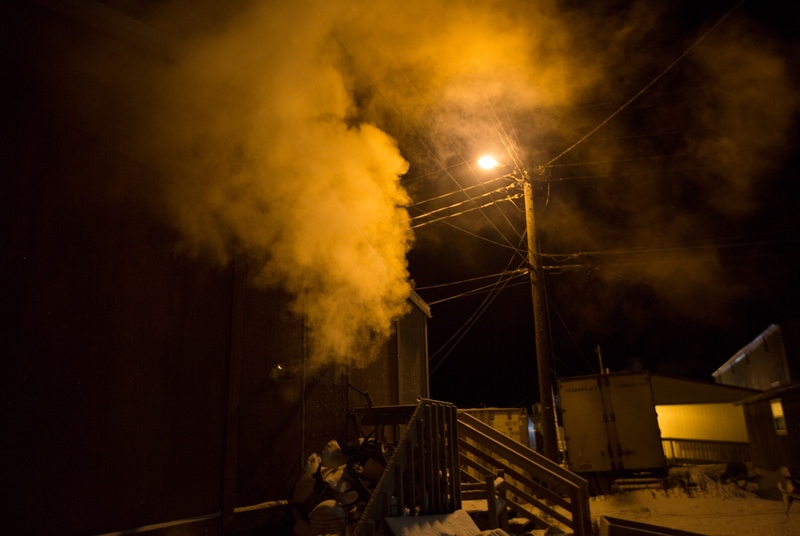 During a frigid night, smoke pours out of the side chimney of a home in Shishmaref, Alaska. Brandon Naykpuk (left) and Justin Schultzi (right) were taking a smoke break in front of their workshop. 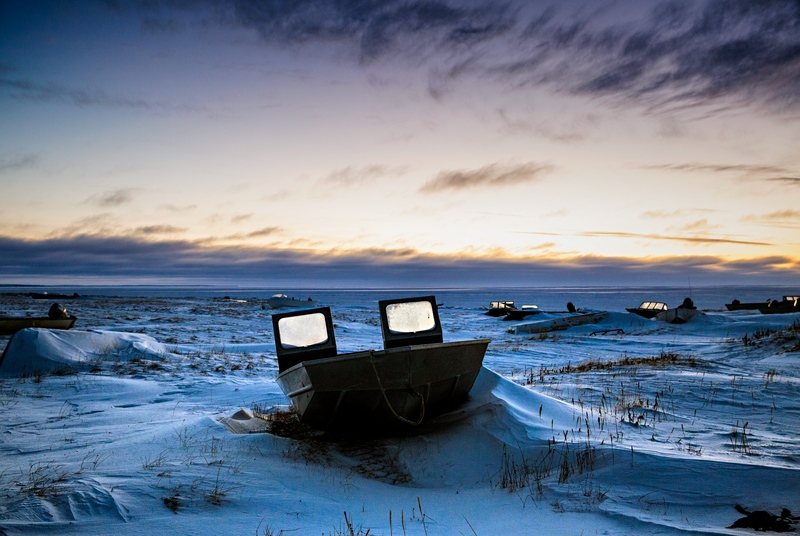 Shishmaref, Alaska is a remote village of about 600 people located 30 miles south of the Arctic Circle, flanked by the Chukchi Sea to the north and an inlet to the south, and it sits atop rapidly melting permafrost. In the last decades, the island's shores have been eroding into the sea, falling off in giant chunks whenever a big storm hits. As the water temperature has increased, the time span the Chukchi Sea stays frozen is getting shorter each year which then exposes the shoreline to the winter storms, accelerating the erosion of the coastline. It is estimated that the Island loses about 10ft to erosion each year and likely the entire Island will be just gone within the next decade or two. The City of Shishmaref is located on a narrow spit of fine, silt-like sand, which is about three miles long and a quarter-mile wide. The City is surrounded on all sides by water making travel by boat or plane the only way in or out of the City. In 2002 (Update: and again in 2016) the City voted to relocate. However, there appears to be very little movement in that direction. In fact, the City Council elected in 2008 has largely ignored the previous plans for relocation and there is no indication that any new plan has been proposed or is in the works. Even if there was a plan for relocation, it is unclear where the funds necessary for such a relocation, which has been estimated to be around $100 Million, will come from. The Federal Government has no program or funds allocated for this project. 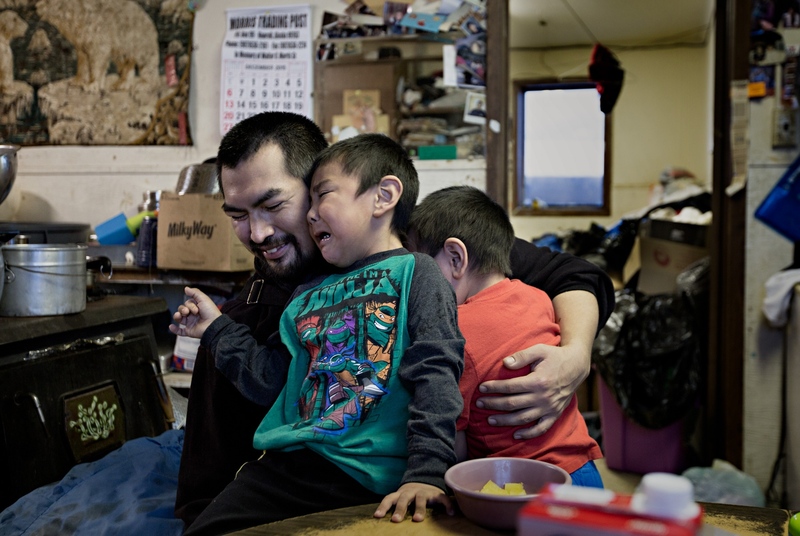 So for now, this traditionally Inupiaq Eskimo village where residents rely heavily on a subsistence lifestyle, hunting and gathering their food, has adopted a sort of wait and see attitude towards their uncertain future. At stake is the existence of this unique native culture, which is comprised of Alaska Native Inupiaq people going back many generations. It likely will disappear should the city not be relocated as a unit and the residents end up scattered around in the mainland of Alaska. Clifford Weyiouanna, a lifelong resident of Shishmaref told me "when the White Man came they told us that our traditional dance and culture was the work of the Devil and they made us not speak our language or engage in our traditional dances." This resulted in the younger generation not speaking the Native Language and the culture has been diluted. The unclear future of Shishmaref will likely deal the final blow. By Nima Taradji Photography — June 17, 2017 - Chicago, Illinois: Oscar Lopez Rivera returned to Chicago to a warm welcome during the Puerto Rican Parade in which he served as the..
By Nima Taradji Photography — During 2011, when Occupy Movement was happening in Chicago and elsewhere in the Country, I spent a lot of time at the corner of LaSalle Streets and..
By Nima Taradji Photography — Beginning in February 2011, the people of Wisconsin began to protest the Wisconsin Budget Repair Bill proposed by the Wisconsin legislature and..
By Nima Taradji Photography — Aiman Youssef is still not home. 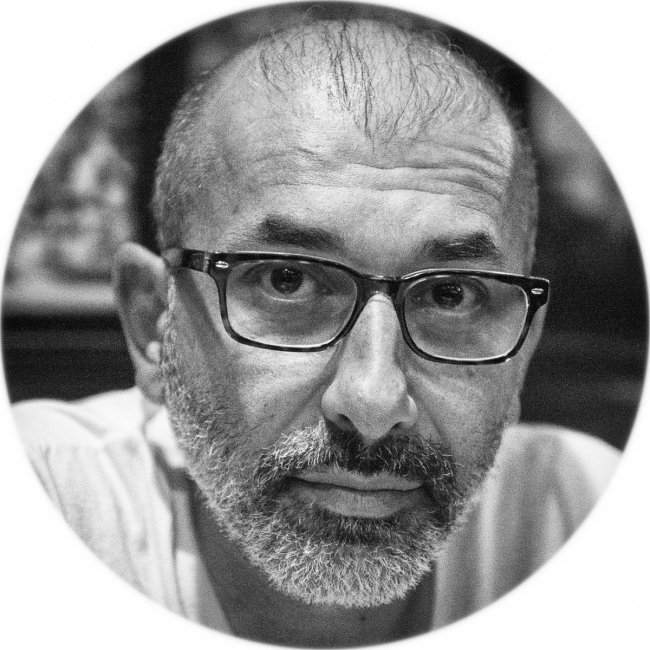 He hasn’t been home since Hurricane Sandy, the second costliest hurricane in US History, hit the shores of..
By Nima Taradji Photography — Once again in July of 2014, the Israelis and the Palestinians fought each other in Gaza. The Israelis conducted air strikes and other military..
By Nima Taradji Photography — Street Photography - Color The images in this gallery are available for purchase. Please contact me directly to order and discuss exact size,..
By Nima Taradji Photography — Street Photography - Black & White The images in this gallery are available for purchase. Please contact me directly to order and discuss exact..